Journalists and a newspaper named as Time Magazine Person of the Year. Haunting stories behind Time magazine's 2018 Person of the Year, & more in News in 5. 1. 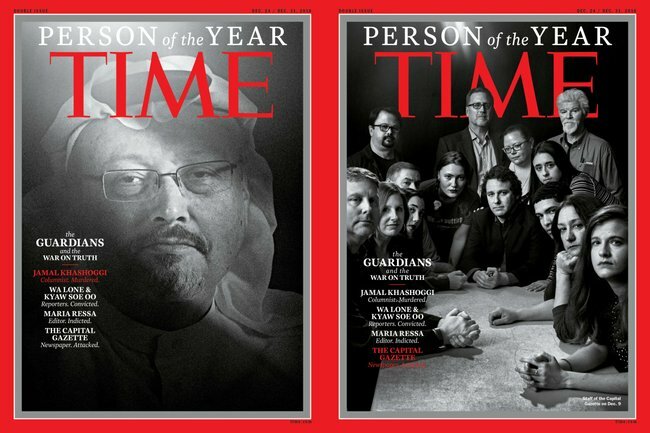 Journalists honoured as Time’s 2018 Person of the Year. Time magazine has named four journalists and a newspaper as its 2018 Person of the Year for what it says is standing up for the truth in the face of persecution and violence. The group, which Time called “the guardians”, consists of slain Saudi journalist Jamal Khashoggi; the Capital Gazette in Annapolis, Maryland, where five people were shot to death at the newspaper’s offices in June; Philippine journalist Maria Ressa, who has been arrested; and Reuters journalists Wa Lone and Kyaw Soe Oo, who have been detained in Myanmar for nearly a year. “They are representative of a broader fight by countless others around the world – as of December 10, at least 52 journalists have been murdered in 2018 – who risk all to tell the story of our time,” editor-in-chief Edward Felsenthal wrote in an essay on Tuesday. Khashoggi was killed two months ago when The Washington Post columnist, who had lived in the US, visited Saudi Arabia’s consulate in Turkey for paperwork so he could get married. He had been critical of the Saudi regime. Four journalists and a sales assistant were killed by a gunman at the Capital Gazette newspaper last (northern) spring. 2. ‘It’s absolutely disgusting.’ Police investigate threats to Chris Dawson’s brother and lawyer. Police are investigating threats made to the brother and lawyer of Chris Dawson after he was charged with the 1982 murder of his wife Lynette Dawson. Dawson’s older brother Peter Dawson and lawyer Greg Walsh have received threatening emails and phone calls. The Daily Telegraph reported a police spokesperson said officers from St George Police Area Command were investigating. Peter Dawson told the Telegraph most of the messages were about what should happen to him and Walsh and what should happen to his brother in jail. “The language is obscene, it’s absolutely disgusting,” he said. He initially ignored them but called police after they started going to his all-female staff. “The language is filthy and my staff are all female and should not have to put up with that,” he said. Police are working to trace the calls and emails which have also been sent to Walsh. Seventy-year-old former rugby league player Chris Dawson was the focus of the 2018 true crime podcast The Teacher’s Pet which presented new leads in the case of Lyn Dawson, who hasn’t been seen since 1982. He is being held in strict protection in jail and will apply for bail on Friday. 3. Partner of NRL player Dylan Walker, accused of domestic violence, expected to retract police statement. NRL player Dylan Walker has pleaded not guilty to assaulting his partner at a home on Sydney’s northern beaches with the young woman now expected to issue a retraction. The 24-year-old was arrested and charged with common assault and assault occasioning actual bodily harm – both domestic violence-related – after Alexandra Ivkovic, also 24, suffered cuts to her shoulder, leg and feet in Dee Why on December 6. The alleged attack occurred between 4.45pm and 5pm with Walker apprehended by police at 5.15pm, according to court documents. Emergency services were called and police say there was one independent witness to the alleged offending. Police have taken out an apprehended violence order on the behalf of Ms Ivkovic, a former Miss Universe Australia finalist, who sat next to her fiance in court talking and smiling. The pair walked into court separately but left hand in hand and departed in the same car. Mr Qutami said he understands a retraction statement will be filed by Ms Ivkovic. Police granted the rugby league player bail after his arrest despite concerns the accused “if released from custody, will endanger the safety of victims, individuals or the community”. The bail documents state the offence “is of a violent nature” involving abrasions and allege Walker “did make admissions to the offence” on December 6. Manly coach Des Hasler picked up Walker from the police station later that night. His bail was continued on Tuesday on the condition he complies with the AVO which states he doesn’t assault, threaten, stalk, harass or intimidate Ms Ivkovic – or destroy or damage property that belongs to her. His matter, along with the AVO, was adjourned to December 18 at the same court to fix a hearing date if required. Walker will be off-contract with the Manly Sea Eagles at the end of the 2019 season. Manly chief executive Lyall Gorman last week said the former Kangaroos representative – who made his NRL debut with the South Sydney Rabbitohs in 2013 – wouldn’t be required for training until after his court appearance. Mr Gorman said the matter has been referred to the NRL integrity unit. 4. Alleged Qld child abductor set for court. A man accused of abducting a seven-year-old girl from a shopping centre and sexually assaulting her in bushland north of Brisbane is set to appear in court. The 26-year-old man allegedly approached the girl at Kmart at Westfield North Lakes shopping centre on Saturday then lured her away. It’s believed she was taken to nearby bushland where she was sexually assaulted, before the man took her back to the shopping centre more than an hour later. He has been charged with deprivation of liberty, taking a child for immoral purposes and indecent treatment of a child under 12. The charges were mentioned in Pine Rivers Magistrates Court on Tuesday morning, but the court was closed to the media. The case was adjourned until Wednesday morning. 5. Woman to be sentenced for killing fiance. 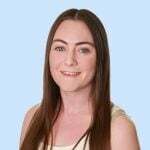 Cathrina “Tina” Cahill, 21, pleaded guilty to the manslaughter of David Walsh, 29, who she stabbed once in the neck in the early hours of February 18, 2017, at the Padstow home they shared with two other Irish nationals. Her plea was based on substantial impairment due to an abnormality of the mind. Cahill, who also had been drinking, was punched by her fiance when trying to stop the attack, before she took out a “large, very sharp, bladed knife” from the cutlery drawer and stabbed him. Cahill gave evidence at her sentence hearing about his repeated violence, including punching strangers and biting her all over her body, his accusations of her sleeping with other men and his deleting texts from her phone. Justice Peter Johnson is due to sentence Cahill on Wednesday in the NSW Supreme Court. 6. Grog tax best way to tackle Aust obesity. A tax on alcohol is the most cost-effective way to tackle worrying rates of obesity in Australia, researchers at a Victorian university say. Analysis by health economists at Deakin University found a levy based on alcoholic content, of 84 cents per standard drink, could help reduce consumption and lead to significant health benefits. Taxing sugary drinks offered the next best value for money, followed by a ban on advertising junk food to children, according to a report published on Wednesday. “Alcohol is high in calories, with a pint of beer almost on par with a chocolate bar, so consumption can have a big impact on daily energy intake,” co-author Associate Professor Gary Sacks said. Almost two-thirds of adults and more than a quarter of children in Australia are overweight or obese. Jaithri Ananthapavan, senior research fellow and the report’s lead author, said the alarming rates can only be addressed through the introduction of multiple interventions, which will require “political courage and commitment”. “Australia’s current obesity epidemic has serious negative health and economic consequences,” she said. The report was funded by a National Health and Medical Research Council Centre of Research Excellence grant.